Very convenient for the train station and only 10 minutes walk from the city center. Room and bathroom a good size. Staff very pleasant and helpful. Good internet connection. Ideal for a one night stay when traveling. 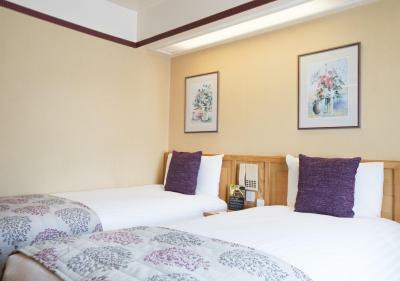 Room was a good size, clean, bathroom quite big,internet worked well, very convenient for the train station if you need it and only about 10 minutes walk from the town center. Staff were very friendly and helpful. Would definitely stay again. It was clean and tidy, the room was as expected, and the staff were friendly, disappointed that there was an £8.00 car parking charge. 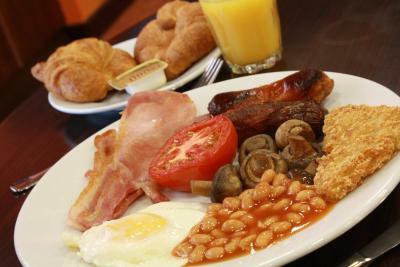 Lovely breakfast, was very well presented. I liked the fact that black pudding was available! Very handy for railway station. There are three hotels almost next to each other, this is my favourite Nice big comfortable bed. Friendly staff, clean and cheap. Very near to the city center and public transport. The hotel has its own private parking lot, free parking is included in the price. So value for money and overall the stay was a pleasant one. The Hallmark Inn is within walking distance of the Derby Train Station and the Derby Mall. 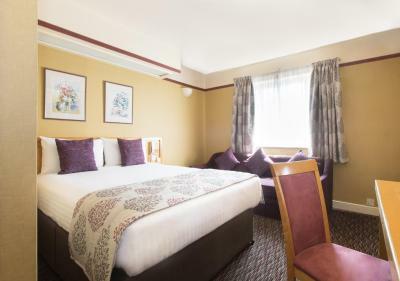 Hallmark Inn Derby This rating is a reflection of how the property compares to the industry standard when it comes to price, facilities and services available. It's based on a self-evaluation by the property. Use this rating to help choose your stay! 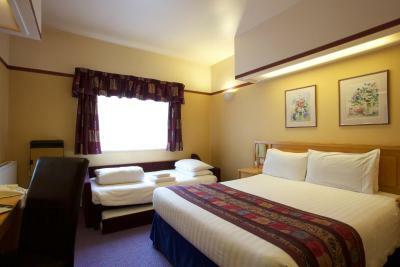 One of our top picks in Derby.Hallmark Inn Derby offers modern accommodations 2 minutes’ walk from Derby Rail Station. Free WiFi is offered throughout the hotel. 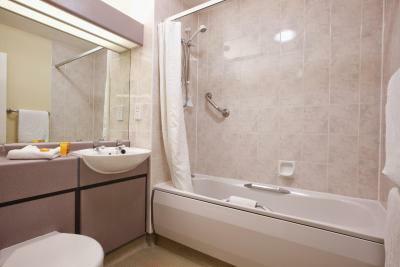 The rooms all have their own bathroom, and offer a 32-inch flat-screen TV with Freeview channels. Each also has a seating area, and facilities for making tea and coffee. 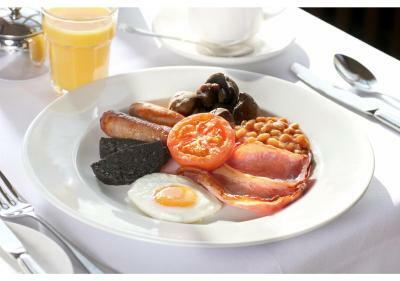 In the morning, guests can enjoy a full English breakfast buffet. 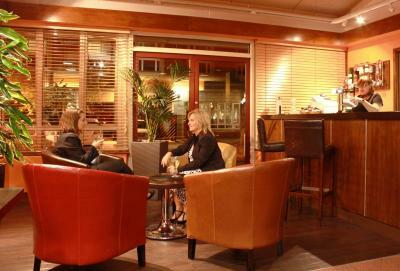 It is a 5-minute walk from Hallmark Inn Derby to central Derby, where there is a variety of shops and restaurants. Alton Towers theme park is around 25 miles away. 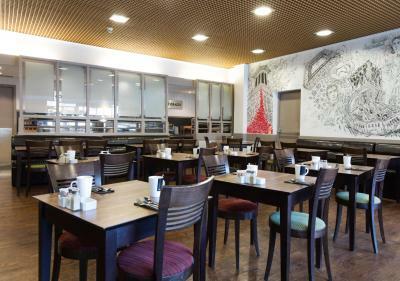 When would you like to stay at Hallmark Inn Derby? 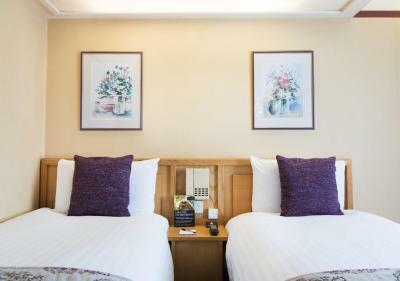 The twin rooms with en-suite include tea and coffee facilities. 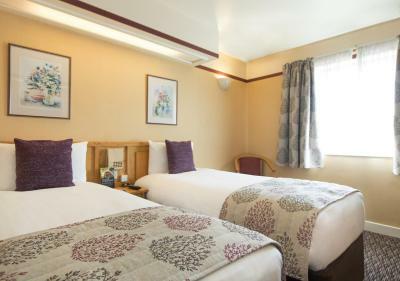 The rooms feature 2 single beds to accommodate a maximum of two guests. Additional amenities include a private bathroom, flat screen LCD TV, work desk, hospitality tray and Essentiel Elements BATHE toiletries collection. Guests can also enjoy free WiFi and Freeview. 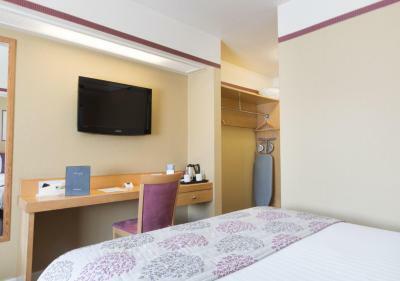 A spacious double room with en-suite bath and shower facilities, a hospitality tray, flat-screen TV, Freeview channels, working desk and chair. Additional amenities include a hairdryer, trouser press, telephone and free WiFi. 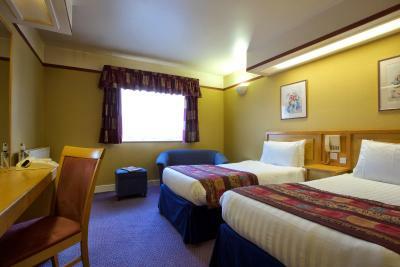 The Hallmark family rooms can accommodate two adults and two little guests or two adults, one little guest and a cot. 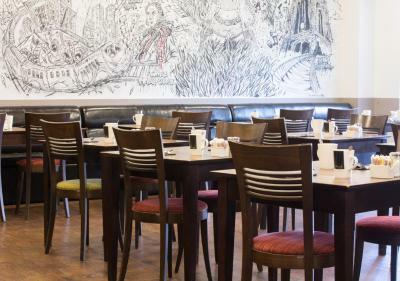 The family rooms contain Hallmark children’s packs and unlimited soft drinks throughout the guest's stay (kids only, adults not allowed) plus special children’s menus in the restaurant. Additional amenities include free WiFi. Please note, children’s dinner is not included in any rates and will be charged for as taken. The Executive Family Room has either 1 double and a sofa bed or 3 single beds with en-suite bath and shower facilities and Essential Elements BATHE toiletries collection. Room amenities include a hospitality tray, TV with Freeview channels, a working desk and chair, a hairdryer, trouser press and free WiFi. 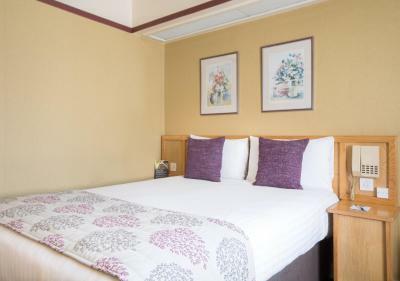 The Hallmark Derby Inn offers double, twin and family rooms, perfect for the business traveler, weekend getaways with the family or friends and ideally located for local attractions, city centre and Derby train station. House Rules Hallmark Inn Derby takes special requests – add in the next step! Hallmark Inn Derby accepts these cards and reserves the right to temporarily hold an amount prior to arrival. Please note the hotel accepts guide dogs. Please note, the parking charge covers 24 hours from the moment of arrival in the car park. Exceeding this allocated time may result in a parking fine. Had to have breakfast over at other hallmark hotel. Room was clean but did find Mark's on bed & bathroom. Lovely staff very welcoming. Very good for money. very close to train station & not far from city centre. the room we were given was in very poor condition, as an old building it is in need of refurbishment, peeling paint, wonky floors and a general air of tiredness. The room was extremely hot, even with the windows open (a fan was already in the room) but the windows were in a terrible state so you wouldn't want to touch them in case they fell out! the net curtains were filthy. 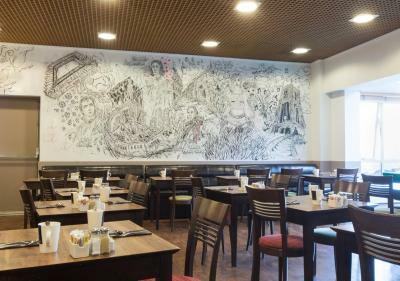 It seemed they were at full capacity so not enough staff at breakfast meant tables not cleared or relaid, no glasses for fruit juice, in fact no fruit. We were moved across the road to the Midland Hotel as there was work being carried out, the hotel is rather grand looking, with adequate car parking. The breakfast needs more tables as some had to sit with people they did not know. The room was clean but a bit dated, i.e. some of the tiles were cracked on the bathroom floor and the sealant around the shower was tired looking. However, it was clean and tidy and a good size. It was good place to stay. I enjoyed the size of the room and the staff were very nice. The room was clean. Good offer for weekend stay. I did not like being woken at midnight by a trolley being pushed on the cobbles at the rear of the hotel and again at 8am!! Are rubber wheels too expensive. I did not like what sounded like a huge door being slammed after either!! Receptionist could have been more helpful. Close to the train and bus station. Not too far to walk into town but a bus every 15mins anyway. There is no notification about the charging fee for the car park while staying at the hotel, you get told when you check in. Breakfast continues to disappoint - not interested in fried & beans. Cornflakes or Bran flakes but only sweet museli/ crunch. Croissants always soggy. No fruit. Can get green tea though. Questionable value for price. Got quiet room. Wifi was reliable and quick enough for emails. staff excellent, very helpful, allowed me to check in early. I cant think of something I didn't like during my stay. the bed was real comfy, cleaning schedule matched my daily plan, the hotel is located a few minutes walk from Derby train station and the English breakfast was fantastic. I also liked the fact that the hotel made provision for an anti-slip mat in the bath putting the safety of guest first. Everything was spot in with comfort and on check in the Girl behind the desk was very helpful and cheery. The waitress in morning was the same. Lovely. Check out staff not very interested. Didn't ask was everything alright? It was unusual not to be asked as you get this everywhere. But we would definitely book again. My partner left an expensive Sleeping mouth gaurd (cost of £1500.00 ) and this had been found by the housekeeping staff. I did call in the evening and the pleasant and very helpful receptionist took my details to hand over. It did take 3 phone calls the following day and till after 2pm to find if this item was recovered from the room the day before. We were staying a couple of days in the Nottingham Forest area and drove back down to pick this up. So we REALLY Appreciate the housekeeping staff for not throwing it away.